Growing in moist land found mostly in the Southern parts of India. Leaves are serrate in nature. Diarrhoea, dysuria, Gonorrhoea, bleeding piles. 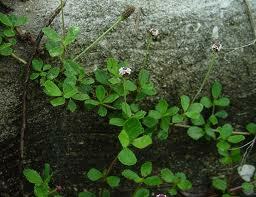 Leaves and young shoots are very bitter and astringent ; they are given to children in diarrhoea ,dysuria and indigestion in the form of infusion or decoction in doses of 1 to 2 ounces twice a day ; also given in lithiasis and to women after the lying-in-state. A fumigation by the compression of the plant between two red-hot bricks gives relief in inflamed and bleeding piles. A paste or pouoltice of the plant is applied to promote suppuration in boils, to swollen cervical glands and to erysipelas, and to chronic indolent ulcers.